Peter McParlin took up fishing on the river Wansbeck in Northumberland at the age of twelve back in the 1970s. His first fish was a trout of eight inches caught on a worm suspended beneath a Winfield float. Flatties, small pollack and slightly larger codling followed from the coast around Newbiggin, Blyth and Amble, and then perch and jack pike from Bolam Lake a few miles inland. 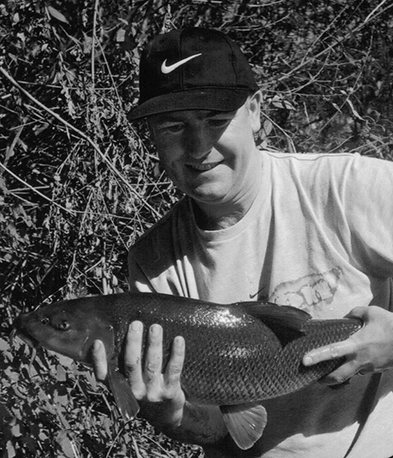 Family holidays in England introduced him to the forbidden delights of carp, chub and roach, resulting in an eventual addiction to coarse fishing. In the midst of this dependence, he discovered Waterlog magazine and began writing articles and books. Nowadays, he is happiest fishing for chub and barbel on the rivers Wear and Swale, and for trout and grayling on the river Derwent. Aside from angling, he is an avid Newcastle United supporter, former columnist for their fanzine, The Mag and author of Standing in the Corner: Watching Newcastle United in the Wilderness Years. A graduate in Applied Biology, Peter worked for a number of years in the pharmaceutical industry, but now has a far more interesting job as a Marine Science Technician at Newcastle University. He is married to Cath and lives in the picturesque Derwent Valley at Rowlands Gill. His latest book is When the Float Comes In - A Year's Fishing on River, Lake and Sea in the North East of England.